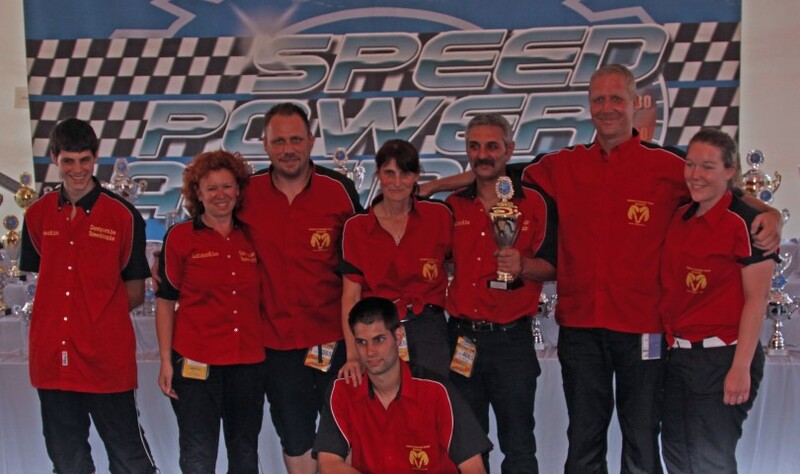 Danny's Racing team spend last weekend at the NitrOlympx in Hockenheim. Already the fourth round of the FIA European Championship and as every year it is very nice to see so many Belgian supporters here at this event. The weather was great during the races, not warm, but hot, very hot!! During the first 3 qualifying runs we had all sort of problems, but worst was the shaking of the front wheels. By the time we went to the last qualifying session, we hoped we had resolved all those troubles. Danny made a straight pass in a time of 5,90 sec. A great feeling after all the bad luck we had since Mantorp. On Sunday in the first elimination round Danny had to face Leif Andreasson. Red light for Leif, but still a 5,855 for Danny against a 5,951 for Andreasson. Into the semi-final against Jarmo Kuutniemi, who was first qualifyer and run a personal best on Saturday of 5,79 sec. Danny had difficulties with staging the car due to clutch problems. He finished in a time of 6,059. Jarmo had red light and a time of 6,284 sec. The final was Danny against Dan Larsen, who was running very persistent all weekend. Unfortunately Danny pulled a red light and the win went to Dan who passed the finish in 5,873 sec. Congratulations to Dan and his team. Danny ended up in second place and the whole team felt really happy with this result. A little bonus for us at the prizegiving ceremony when we received the trophy for "best appearing crew". We are now looking forward to the finals in Santa Pod in a few weeks time.